While investors have focused on the recent stock market recovery, one important development has largely been overlooked: the end of the Fed’s rate-hike cycle. 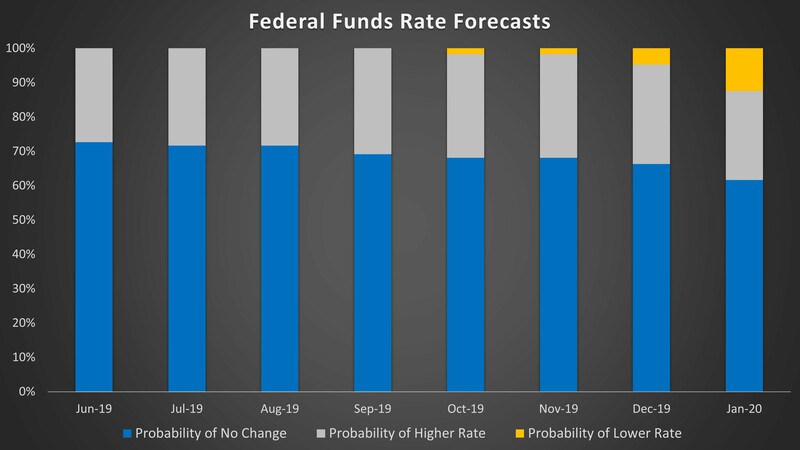 According to the current probabilities implied by federal funds futures prices*, the target federal funds rate will likely remain unchanged between now and January 2020. The market gives that scenario better than a 70% probability. The likelihood of another hike is around 30% through the fall, after which it becomes increasingly likely that rates will actually decrease. Recent public communications by Fed board governors and bank presidents also suggest Fed policy has entered an extended pause, despite the FOMC’s dot plots continuing to project additional hikes this year. Sage is currently in the “Fed is done” camp. We see mounting evidence that the U.S. and global economies are slowing, and fundamentals in Corporate America are deteriorating. As these trends continue, further hikes will become increasingly unlikely. * Source: Bloomberg, as of 1/18/2019.